Friends of Beard talk about his influence on the world of food. Long before the head of the James Beard Foundation was caught cooking the books, and long before the Foundation was even created, James Beard was cooking – cooking up a food revolution, that is. In the 1940s & 50s when the nation was reveling in American Jell-O salads, cocktail wiener canapes, and Pepsi-Cola Cakes, James Beard was busy creating local, seasonal American dishes, launching a revolution in food that is now only starting to be realized. Ruth Reichl, editor in chief of Gourmet magazine, food historian Betty Fussell, Alfred A Knopf editor Judith Jones, and NYU food studies professor Marion Nestle join restaurant consultant and author Clark Wolf, in an intimate discussion about Beard’s life and the enormous influences of this remarkable chef. “Today American Cookery is at a crossroads somewhere between technology and tradition…While I do not overlook the grotesqueries of American cooking, I believe we have a rich and fascinating food heritage that occasionally reaches greatness in its own melting pot way…We are barely beginning to sift down into a cuisine of our own.” -James Beard, AMERICAN COOKERY In the 40s & 50s when the nation was reveling in American Jell-O salads, cocktail wiener canapes, and Pepsi-Cola Cakes, James Beard was busy cooking up local, seasonal American dishes, launching a revolution in food that is now only starting to be realized. Founder of the James Beard Cooking School in New York City and author of 22 cookbooks, Beard, who was known as “The Dean of American Cuisine,” proved to the world that delicious, fresh food could be found here in America and showed us how to enjoy simple, freshly prepared meals made with wholesome ingredients, paving the way for future food revolutionaries like Alice Waters. 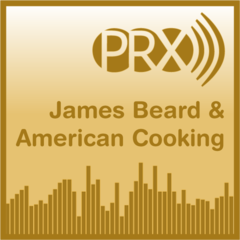 In this HOUR LONG DEBUT special [30 minute version also available on PRX], we will get a rare glimpse of the man behind the apron when friends and colleagues Ruth Reichl, Betty Fussell, Judith Jones, Clark Wolf and Marion Nestle gather together to reminisce about Beard’s life and talk about the enormous influences of this remarkable chef and his times. In addition, this intimate portrait of Beard will be enriched with excerpts from the James Beard Papers, letters written to and by Beard over the years, some from culinary pioneers such as MFK Fisher, Julia Child and Elizabeth David, among others. Funny, poignant and sometimes sad, they reveal the very private and personal dimensions of Beard’s life [who died in 1985] while also connecting the listener to the joys of food and cooking, reaffirming the value of close friendships and precious moments of everyday life.